Longwalk is a colt ignorant of the world outside his tribe's isolated valley. He's never heard a gunshot in his life and wouldn't know a radscorpion from a radgator. And what does 'rad' even mean anyway? But he's about to get a crash course in Wasteland Survival 101 when an unusual discovery leads to a dangerous sojourn into the vast wastes beyond his humble home. Ignorant or not Longwalk is going to have to learn fast if he wants to survive mutated monsters, heartless mercenaries, perilous ancient ruins, overly dramatic villains, long winded plot exposition, politics, and perhaps most dangerous of all, the friends he makes along the way. 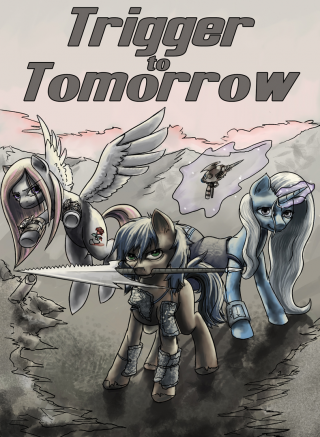 Based on the Fallout Equestria universe created by Kkat and the Wild Arms game series by Media Vision.